After a whirlwind 11 weeks, Friday 18th December was launch day for the CIF-supported Peter McVerry Trust development at Hogan Court in Dublin 2. 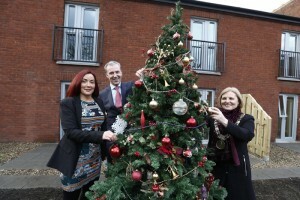 CIF member firms and supporters had joined forces to refurbish 12 homes for the homeless in time for Christmas. Two tenants joined CIF staff, Peter McVerry personnel and local politicians to celebrate a fantastic achievement. CIF President, Michael Stone, summed up the efforts as a “unique project that brought together the skills and expertise of more than 35 CIF member firms, who have generously donated time, money, and materials, all with the aim of taking homeless people off the housing waiting lists. According to the CIF President everyone from the construction side of the project was “delighted” to be working at Hogan Court. For Fr Peter McVerry, who also spoke at the launch, the houses “tell our tenants how society values you”. Offically launched by Ard-Mhéara BAC, Críona ni Dhálaigh, and Minister of State at the Department of Social Protection, Kevin Humphreys TD, the development had consisted of a vacant building comprising 12 individual units. The properties were in need of complete refurbishment and upgrading to make them habitable, along with some external works to the site. The units, which had been used predominantly to provide housing to older individuals, had fallen into a very poor state of repair. Vandalism and dereliction meant that many of the units required extensive renovation in order to make them habitable. The project saw extensive internal renovations of the properties, with new windows, electrics, plumbing, dry lining and improvements made to fire safety standards and ventilation. External works focused on creating a more aesthetically appealing block of apartments and accessibility for people with disabilities to the ground floor units. Landscaping of the green areas will add to the construction improvements and help achieve a significant improvement in the visual amenities in the community. Pat Doyle, CEO of Peter McVerry Trust, said: “We are delighted to have been able to partner with CIF members and their supporters to deliver these units. We’d like to thank everyone who contributed to the project that has left us with 12 high quality studio apartments which are ideal for single people in need of social housing. “These 12 units represented were unlikely to have been brought back into use in the coming years without the support the CIF. Now they are not only a stable and secure home for 12 individuals but they represent a new start, new opportunities and the security and peace of mind that all people in homelessness or precarious housing situations crave. The new tenants will be individuals taken from Dublin City Council’s housing list including people coming directly from homeless services. Individuals are the largest group within homelessness in Ireland, yet they find it extremely difficult to access social housing, which have historically been built as family homes. 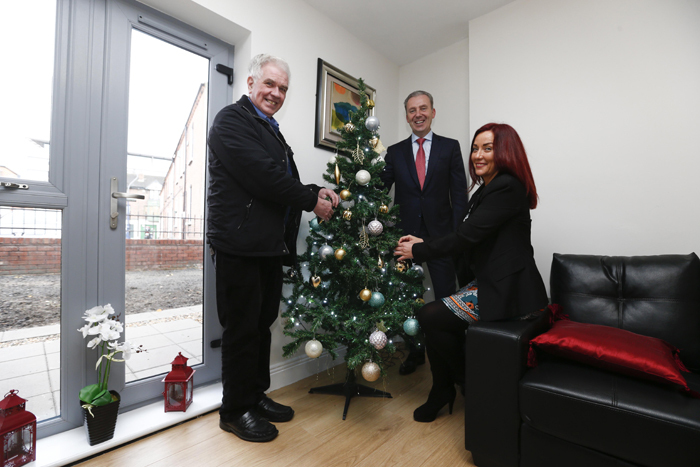 Each individual regardless of their level of need will have the support of Peter McVerry Trust’s highly skilled ‘Housing with Supports’ team. This team will work to ensure that tenancies are sustained and that residents are supported to integrate into their community by partaking in education, training and employment. An on site caretaker will also aid the work of the housing with supports team.